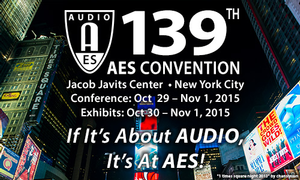 If it’s about audio, it’s at AES, and this year’s 139th International AES Convention, October 29 – November 1, 2015, at the Jacob Javits Center in New York City, is slated to host the most in-depth Technical Program of the year for audio professionals. Bringing together individuals of all skill and experience levels from around the world, the AES139 Convention offers attendees four full days of comprehensive Technical Program presentations including Workshops, Tutorials, Paper Sessions, Student & Career Development Events, Special Events and more. These diverse events offer unprecedented access to the latest technologies and techniques in the fields of recording and production, live sound, broadcast and streaming, mixing and mastering, audio for gaming, system integration and other leading topics. Additionally, AES139 will offer three full days of pro audio manufacturer exhibition, as well as FREE specialized presentations on the convention’s Live Sound Expo (LSE) and Project Studio Expo (PSE) stages. Advanced Registration pricing is still available, as well as free Exhibits-Plus badges. Papers, Tutorials, and Workshop presentations in the AES Convention Technical Program represent the latest scientific and in-the-field research of audio concepts and applications. Paper topics this year include timely subjects ranging from Audio Education and Forensic Audio, to Cinema Sound, Sound Reinforcement, Spatial Audio and more. Tutorial topics are slated to include “Interactive Music: Past, Present and Future,” “Main Microphone Techniques for 2.0 and 5.1,” “Listening Tests – Understanding the Basic Concepts,” and other in-depth topics of interest. Additional topics in the Workshop series will include “Low Frequency Behavior in Small High Accuracy Listening Environments,” “Perceptual Evaluation of High Resolution Audio,” “AES67 Interoperability Testing,” “Hot Topics in Intellectual Property” and many more over the convention’s four days. Many facets of the AES139 Technical Program are directly linked to the series of specialized, topical Tracks, which offer direction to related events and presentations in a specific audio field. This year’s Tracks, representing several of the major areas of focus for attendees, include Archiving and Restoration, Broadcast and Streaming Media, Game Audio, Live Sound, Networked Audio, Product Development, and Recording and Mastering. In addition to the full schedule of educational opportunities and technical presentations, AES139 also offers unprecedented opportunities to network with industry legends, up-and-coming professionals and peers on the Convention floor, as well as through the offsite Tech Tours and other events around New York City, hosted by exhibitors and sponsors. Opening Ceremonies and other Special Events, including Keynote speakers, the annual Heyser Lecture, and a large Student and Career Development exhibition area, add to the community aspect of the Convention and present many unique and memorable experiences for all in attendance.